﻿A new exhibition is now on display at the RNCM as part of Archives Awareness Campaign 2011. 'Manchester: musical metropolis' celebrates the rich musical heritage of Manchester and the contribution made to the city’s culture and community by musicians who emigrated here from continental Europe in the mid to late 1800s. In particular there was a strong German community in the city whose cultural influence was felt in orchestras and ensembles, musical clubs and societies. ﻿﻿﻿﻿This distinctive musical life is revealed through photographs, programmes, letters and musical scores spanning the 1840s to the 1930s, chosen from the papers of Sir Charles Hallé, Carl Fuchs, Adolph Brodsky, Hans Richter and Simon Speelman. The exhibition coincides with a concert on 16 December by the RNCM Symphony Orchestra, featuring Tchaikovsky's Violin Concerto in D major, Op 35. Brodsky's annotated copy of the score for the piano part of this concerto is on display, along with the orchestral score of Die Walkure, presented to Hans Richter by Wagner. The concert also includes Elgar's Symphony No 1 in A flat major. This work was first performed in Manchester in 1908, conducted by its dedicatee Hans Richter. The exhibition is a collaboration between the RNCM Archives, the Hallé Concerts Society Archives and the Henry Watson Music Library, and can be found on the lower concourse at the RNCM, outside the concert hall. During the closure of Manchester Central Library, selected items from the Henry Watson Music Library, relating to the history of music in Manchester, are available to researchers at the RNCM Archives. 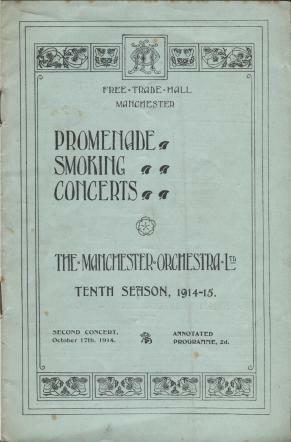 The collection spans the late 18th to the late 20th centuries and includes programmes of musical societies, concert halls, orchestras, choirs and festivals, including the Ancoats Brotherhood, the Halle Concerts Society, the Manchester Gentlemen's Concerts and the Schiller Anstalt, to name but a few. There are also minutes, annual reports, lists of members and subscribers, correspondence, press cuttings, accounts and scrapbooks. Many important names from Manchester's musical past crop up in the collection. Letters received by the German cellist Carl Fuchs sit alongside manuscript volumes compiled by Sir Charles Halle, recording his work as a music teacher, pianist and conductor, and press cuttings about Hans Richter's appointment and resignation as conductor of the Halle Orchestra. Family historians will also find this an unexpected source of information about musical ancestors from the greater Manchester area. A list of the collection has now been compiled and you can find this on the RNCM Archives webpages. To view items from the collection, contact the College Archivist and Records Manager, T 0161 907 5211 or E archives@rncm.ac.uk. You can find out more about the Henry Watson Music Library by visiting Manchester City Council Libraries webpages, or contacting henrywatsonmusiclibrary@manchester.gov.uk. To mark the second Manchester International Violin Competition, an exhibition based on the papers of Adolph Brodsky, the Russian violinist and principal of the Royal Manchester College of Music, is now on display at the RNCM until 5 December. 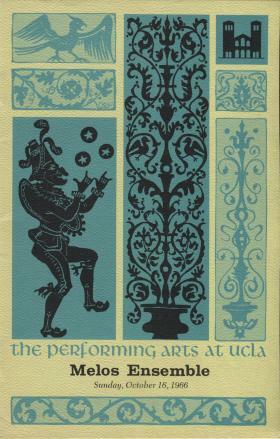 ﻿﻿Brodsky’s musical career as a performer and teacher is revealed through letters, photographs, programmes and other treasures from the archives, spanning the 1860s to the 1920s. The history of the College, and of music in Manchester, would not be the same without Brodsky’s influence and commitment. Brodsky's annotated copy of the piano part of Tchaikovsky's violin concerto, op. 35, which he was the first to perform in public in December 1881. 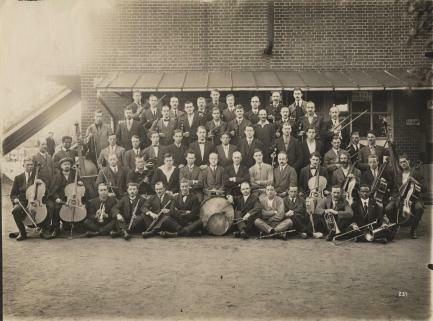 A photograph of the orchestra of the Royal Manchester College of Music, conducted by Brodsky, circa 1898. 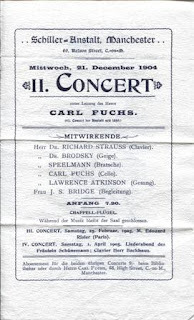 The programme for the first concert given by the Brodsky Quartet, accompanied by Brahms, at the Gewandhaus in Leipzig, February 1884. The competition runs from 26 November to 3 December at the RNCM and features a violin making marathon during which four of the country's finest violin makers will make a copy of the RNCM's 'Brodsky' Guadagnini violin. For tickets to the concerto final on 3 December, go to http://www.rncm.ac.uk/. Admission to all other competition events is free. For further information about the competition, contact mivc@rncm.ac.uk or visit www.rncm.ac.uk/mivc. The latest accession to the RNCM archives, the papers of Bill Waterhouse (1931-2007), arrived in early September. Mary Ann Davison has written in an earlier post about his contribution to the Collection of Historic Musical Instruments at the RNCM. After studying at the Royal College of Music, his long career as a professional bassoonist began with the Covent Garden Opera orchestra in 1953. He joined the Royal Manchester College of Music (one of the RNCM's predecessors) in 1966 as professor of bassoon. Letters from his friends and fellow musicians﻿﻿ include the Dutch pianist Caecilia Andriessen; Canadian bassoonist and founder of the International Double Reed Society Gerald Corey; American composer and violinist Stanley Weiner; and the Swiss conductor Francis Travis. The material received so far is only part of a larger collection and a small reflection of the work of a fine bassoonist. We are grateful to Elisabeth Waterhouse, Bill's wife, for her kind donation. 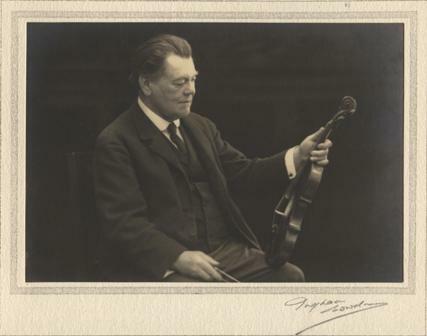 ﻿﻿﻿﻿﻿A further donation of material relating to the German cellist Carl Fuchs has been made to the RNCM Archives by his granddaughter Tessa. This photograph was one of the more unexpected items found as I catalogued the collection. It was sent to Fuchs by the cellist WR Cooper, who is on the far right of the second row. 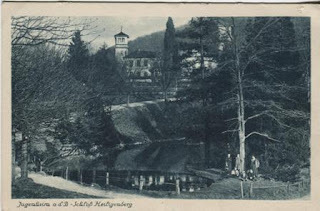 Fuchs was interned briefly at Ruhleben after the outbreak of the First World War. Although he had settled in Manchester in 1888, he and his family were on holiday at his parents' home in Jugenheim in summer 1914. The camp was housed in the racecourse at Ruhleben. In his autobiography, Fuchs recalled living in a hayloft and dining in the grandstand. Music formed a part of the life of the camp from its early days. ﻿The Fuchs papers have been received in several instalments and a single, unified online catalogue has now been created. This can be viewed here, by a quick search on 'CF' in the RefNo box. The latest additions include correspondence, scrapbooks, concert programmes and cuttings, and a collection of annotated musical scores. 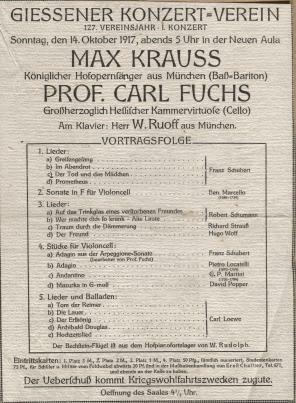 Fuchs has added programmes and cuttings to each score, allowing us to see when and where he performed each piece. 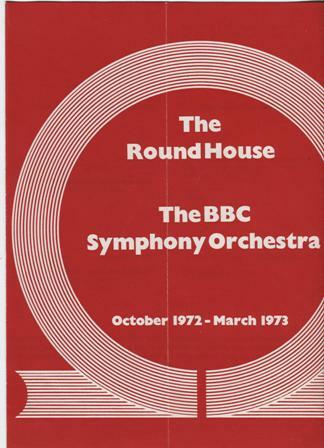 This programme, found in the score for David Popper's 'Mazurka I - For Bernhard Cossmann', op. 11 no. 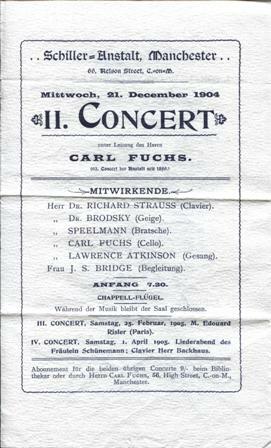 3, shows how Fuchs was allowed to perform in Germany during the war. After being released from Ruhleben in early 1915, he returned to live in Jugenheim. He joined the orchestra of the Darmstadt Opera and also played in the Frankfurt Museum Orchestra. He was given permission to return to his family in England in March 1919.